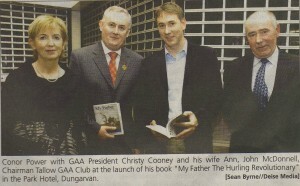 “My Father: A Hurling Revolutionary, the life and times of Ned Power” is out on paperback at the end of November 2009. Click here for further information, pre-order and excerpt. Before delving into the latest GAA Book this year, it’s worth noting that our national broadcaster is looking after its citizens in the area of transmitting what remaining important matches there are left to play this season. The national club championships are a strange sort of end to the year, I have always thought. I’ve wondered about how motivation can be kept going at this late hour of the year, when so many people have deserted the trail of adventure that the summer brought and when the weather is even more awful than it is in summer. From the comfort of your home, you can follow most of the action live by tuning in to one of the most worthwhile uses of tax euros – TG4: as creative and energetic a channel as you’re likely to find anywhere. So many people in this country of ours pay out a subscription to a nasty half-wit megalomaniac to watch overpaid clowns cheat and feign injury on the circus that is the English professional soccer league. See some real people playing real sport for real reasons on TG4 every weekend with the All-Ireland hurling and football championships. 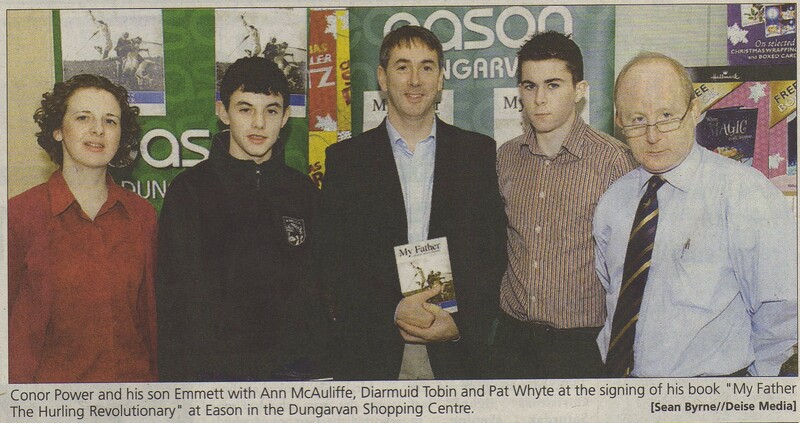 Once they’re over, then get back to your GAA books. 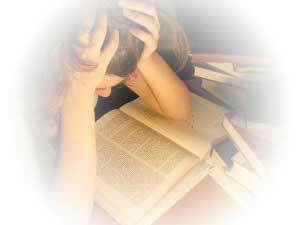 Over at An Fear Rua, a vote has been gathering as to what is the best GAA book of 2009. So far, Henry Martin’s “Unlimited Heartbreak” seems to be well in front with Cody’s biography scoring a low count just at the moment. Also, Donal Og Cusack‘s biography/autobiography is not really on the radar just yet. The poll should be more interesting once the reading public has had a chance to get their teeth into the books that will be put out over the coming month. So far, the size of the votes seem to be reflective of how long the book is out, so before the end of the year, we may get a more representative picture emerging. One that isn’t out yet (although it will shortly be in print – this week, in fact) is the biography of Ned Power – due to be launched in Dungarvan on the 26th of November. 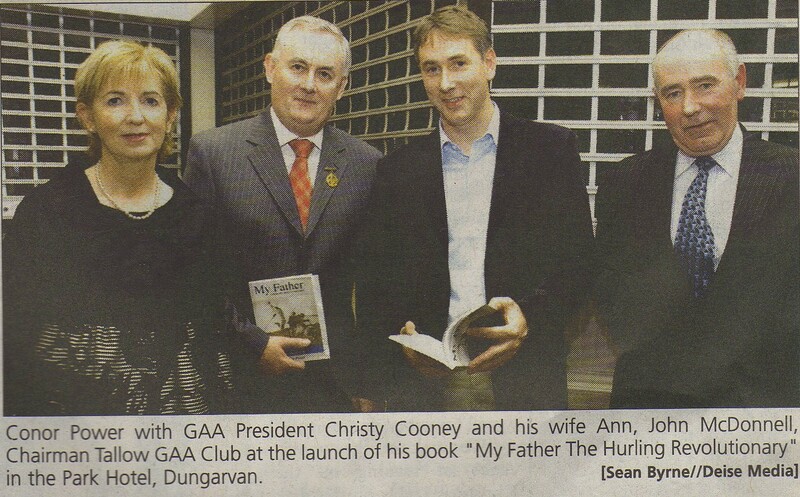 Part hurling book and part memoir, it will have a broader appeal than most so-called GAA books and it will therefore be interesting to see how it fares. 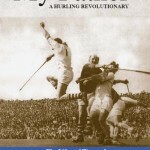 There was time when hurling books and GAA books were all about snippets of reminiscences of the good old glory days of one team or another or some player or group of players. There’s nothing wrong with that. There are still books like that coming out. Even the one about Ned Power is a little bit like that in many ways. 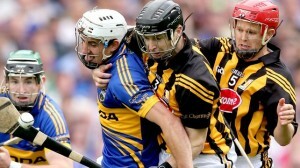 The GAA itself brought out a coffee table book of many images recently too. 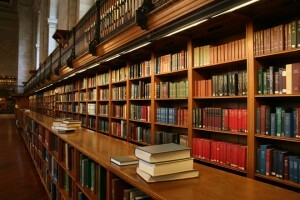 But nowadays, the tendency is for the “tell-all” book; the one that reveals something spectacular, something sensational, something controversial that will have the head honchos in Croke Park bristling and the ladies in every parish blessing themselves while the gentlemen hang their heads and tut them over and back in disbelief and disgrace. But are these books saying anything worthwhile? Yes, and no, I suppose. It’s all down to how sincerely and entertainingly the thing is written. The novelty wears off and you soon see what you’re left with. Just don’t judge a book by its cover. 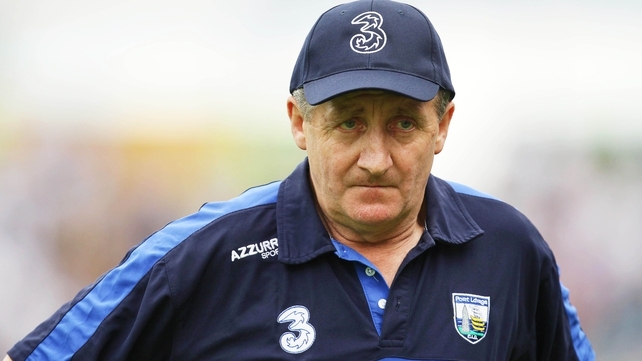 Concerns of safety seem to be dominating a lot of the decision-making by the GAA national council. 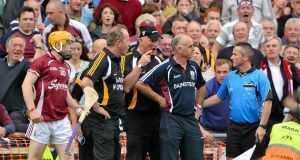 The attempted halting of the pitch invasion at the Hurling All-Ireland final and the new rule requiring the wearing of protective head gear by all players (even goalkeepers) were decisions that were taken in the name of improving safety for players. The debate is going to continue on both issues for a time to come. From my own slightly cynical point of view, when I hear organisations talking about safety issues, I feel the pervasive presence of an insurance company whispering in the ears of decision-makers. 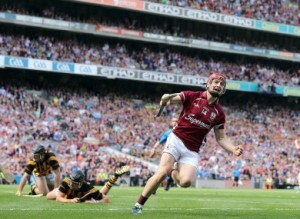 It’s also linked, perhaps, to the growing presence of the GPA and it represents, perhaps, a marking of lines – a defensive ploy, a laying down of a few sandbags if you like – in anticipation of the bitter battles to come between the GPA and the GAA. 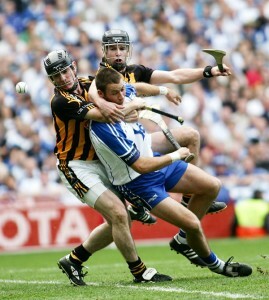 Kilkenny Helmet Police arresting Dan Shanahan for the non-wearing of his helmet during this years AI SF. But being bright and positive about it, although the measure of forcing senior goalkeepers to wear the sight-restrictive clobber seems quite daft, the whole exercise has already proven itself at lower levels in reducing the rate of serious accidents. So that’s a good thing to be welcomed. It remains to be seen what effect it will have on defenders and goalkeepers, however. I’m betting that next year’s championship could see an even higher aggregate score amongst teams. Fifty years ago, Waterford were knocking in an average of about six goals per game on their way to their last All-Ireland win. If they could get ahead of the posse and invent some class of helmet that would allow the goalie to see through it, then the advantage would be with them and we’ll see how many goals they’ll knock in against the likes of Kilkenny then!